Dream Pod 9: New Jackal 3D Model Preview! Another preview today that will make our Peace River players happy. Tony finished up another 3d model this week, checkout the attached image of the new Jackal 3d model, variants, and exploded parts view. The Jackal is not one of the core Peace River models that we'll be doing into plastic as part of the upcoming Kickstarter, but is an important army option thats been missing from the game for Peace River players. We'll be making the Jackal as a Two Pack in pewter with one standing and one running pose, plus one set of standard arms and one set of arms that can hold the weapon across the torso. Along with two sets of the stock weapons and one set of the weapons for the Vanguard, Kestoros, and Fusillade variants (see image). 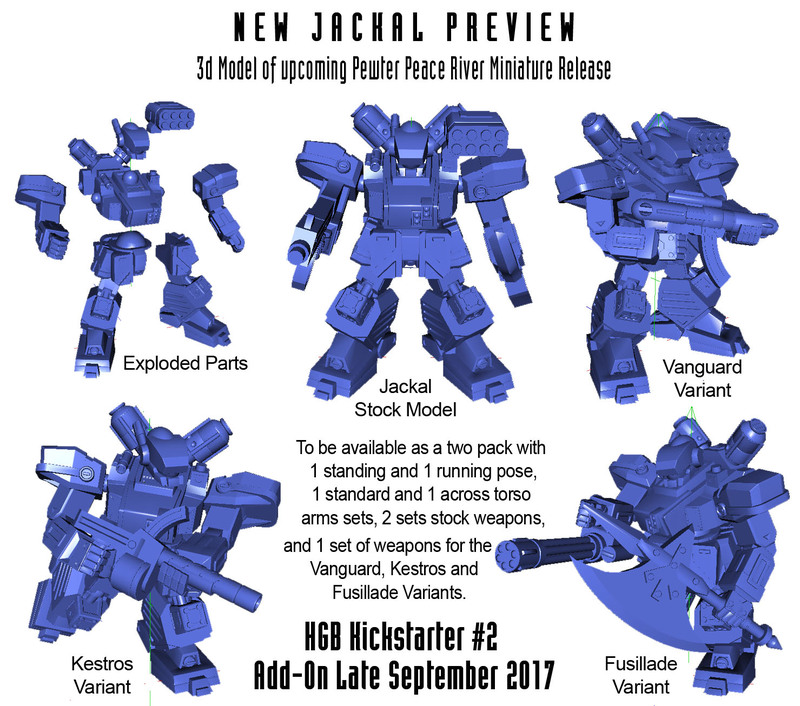 The Peace River: Jackal Two Pack will be available during the upcoming Heavy Gear Blitz Kickstarter #2 in late September as an Add-On. And later this year on the Dream Pod 9 Online Store. Home › Blogs › Robert Dubois's blog › New Jackal 3D Model Preview!